Every now and then we all like to slip down to the local! Shaldon and its residents are no different of course and would thoroughly recommend all visitors to try one of Shaldon's well know and well frequented pubs. Below you will find a little information on these locals. The Ferry Boat Inn is a much loved westcountry pub. Right on the banks of the Teign estuary the beer garden literally overlooks the beach and estuary. This is the a real locals local serving Real Ales and good quality wines. Thye also have a good reputation for food. 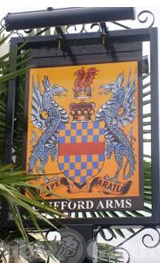 The beautifully restored and refurbished Clifford Arms is once again in the capable hands of owners Mike and Linda Balster. A fully functioning Restaurant and elegant bar is available , and special events and menus such as regular Monday night Jazz Cafe evenings are now taking place. 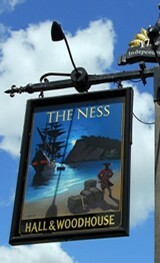 The Ness is an elegant Georgian pub, located on the outskirts of the charming village of Shaldon overlooking the Teign Estuary with magnificant views of Teignmouth and the beautiful unspoilt Devon Coastline. The Smugglers Inn offers a wide range of real ales and draughts, along with regular guest ales. There is a Farmers Feast Carvery of local meats along with a full menu, available 7 days a weeks. meals may be enjoyed in the restaurant itself, or in the informal bar areas, and when the weather is kind, outside in the Beer garden or Patio where the stunning sea view can be most enjoyed. Coombe Cellars is a traditional village pub & restaurant in Combeinteignhead serving tasty, freshly cooked food and top-drawer drinks, with a log-fire when it's chilly and a great beer garden for the warmer weather. You'll find us on the south bank of the Teign estuary between Newton Abbot and Teignmouth Bridge at Shaldon, close to Bishopsteignton, Torquay, Dawlish.